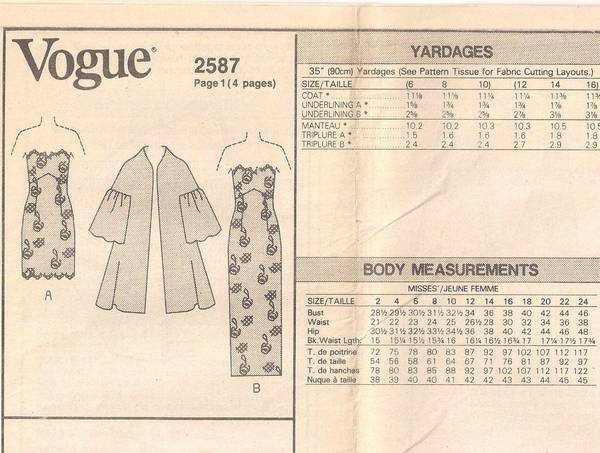 Vogue American Designer pattern from 1990 for strapless gown, dress and flared coat. The self-lined coat, above mid-knee, has front extending into shaped back yoke, inside straps and 3/4 sleeves. (see additional image below for details). The close-fitting, lined, straight dress, in above mid-knee or evening length, has raised waist, foundation, back zipper and hemline slit. Sizes 12, 14, 16 included. Uncut, complete and factory folds. Envelope has light storage wear. Contents are in excellent condition.